Find Orlando Luxury Homes for Sale and Orlando Luxury Real Estate Listings. Search the Orlando MLS for Luxury Houses, Vacation Homes, Prices, Pictures & Market Information. 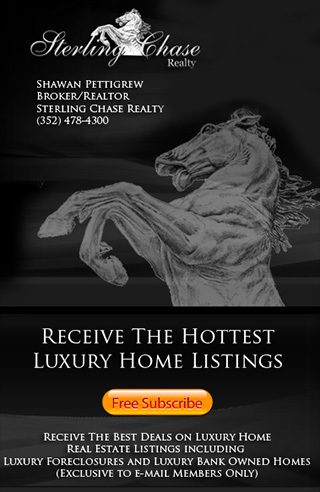 Sterling Chase Realty features the Orlando Florida Luxury Real Estate market as one of the top ten places to buy a home. Here you can find the best Luxury Homes for Sale including Orlando Luxury Vacation Homes, Orlando Holiday Homes, Orlando Luxury Foreclosures, Orlando Luxury Bank Owned Homes Orlando Luxury Short Sales & more! Orlando Florida is a great place to live with amenities right out your door, everything from world class shopping, the Finest in Dining and of course Orlando Theme Parks including Walt Disney World, and Universal Studios to name a few.